TMD’s are a group of conditions affecting the temporo-mandibular joints (TMJ) and the muscles attached to them. TMD’s affect 5-12% of the population and are more common in females and the elderly. 65% of TMD’S become recurrent, as a result an early diagnosis and correct management is essential. 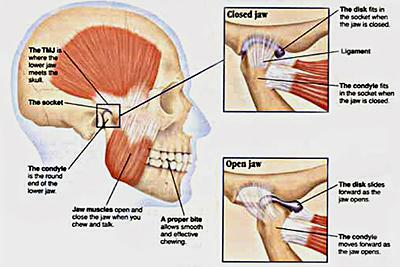 The temporo-mandibular joint (TMJ) connects the jaw to the skull and allows the mouth to open and close. The TMJ is a synovial joint that has an intra-articular disc which allows the joint to move through a large range of motion. The intra-articular disc can become displaced in some TMD’s and cause clicking. The cause of TMD’s is variable from trauma, bruxism, grinding, nail biting and stress. The neck is closely related to the TMJ and can be a significant contributing factor in TMD’s. Management involves a thorough assessment of the neck and TMJ movement and muscle control. Mobilisation techniques may be required to improve joint mobility along with mobility exercises. Some TMD’s may require releasing of tight muscles or strengthening of the muscles around the TMJ. Postural re-training may be indicated along with stress management advice. Physica staff have had extra training in the assessment and management of TMD’S. Andrew Seymour from the Ringwood practice has a special interest in treating these conditions and works closely with specialists who treat TMD’s.